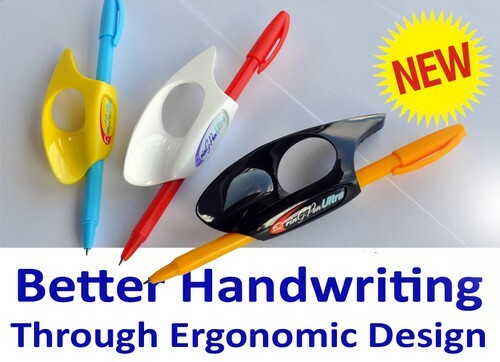 The all new Ring-Pen Ultra is the next generation of ergonomic writing tools. Now you choose what pen, pencil or paint brush you want to use on your letter, work, project, craft, report, presentation, etc. Designed to help anyone with Arthritis, Carpal Tunnel Syndrome, Repetitive Stress Syndrome or for someone that lacks fine motor skills in their fingers or wrist. Also a great product for someone that writes a lot to reduce the pain and cramping that can be associated with the need to tightly grip a conventional pen or pencil. General guideline for choosing sizes. Large will work for most men's hands and larger women's hands. Medium will work for most women's hands and for smaller men's hands. Small is best suited for children. Colors will vary by size. Currently available only for right-hand writers. For lefties please consider the original Ring-Pen since we do not have a date from the manufacturers for a left-handed Ultra.